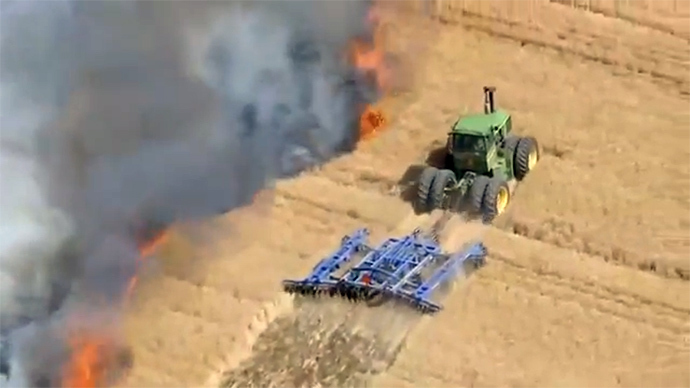 A Colorado farmer on Monday risked his life to stop a wildfire that broke out in a Weld County hayfield, using his tractor to dig a fire line just a few feet from the scorching blaze. After a thunderstorm brought lightning to a rural area near Brighton, Colo., a fire broke out and quickly consumed 20-30 acres of an 80-acre hayfield. To prevent the fire’s spread, local farmer Eric Howard got in his John Deere tractor and chased the flames, digging a fire line around the blaze to cut off its path. Black smoke surrounded the tractor as Howard skimmed the largest part of the fire, but the farmer persisted until he had contained the deadly blaze. Fire lines, also known as firebreaks, create gaps that deprive fires of vegetation to burn, keeping them contained within the area. Fires sometimes jump over such lines, but can be held back temporarily. The farmer’s efforts were enough to contain the blaze until firefighters were able to extinguish it. 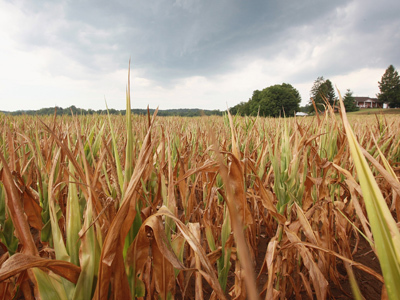 Weld County produces the most grain in the state of Colorado and is considered a high value area for farmers. Howard’s daring response saved an estimated 50 acres of the 80-acre hayfield. But Colorado has recently experienced several devastating wildfires, and dry conditions in Weld County leave open the possibility for additional summer blazes. In June, more than 500 homes were destroyed near Colorado Springs in the Black Forest fire, killing two residents and forcing thousands to evacuate. The fire was the most destructive in state history, causing over $80 million in damages, the Colorado Springs Independent reported. In late June, 11 separate fires burned through 139 square miles of Colorado at the same time, due to low humidity, high wind speeds, and little precipitation. 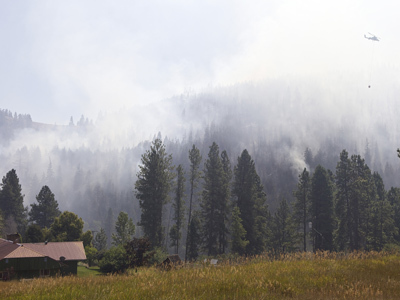 The cluster of fires were known as the West Fork Complex fire, and collectively spanned over 53,000 acres. “It’s not typical to have these kinds of fires here,” Pete Blume, a commander with the Rocky Mountain Type 1 Incident Command Team, told AP. 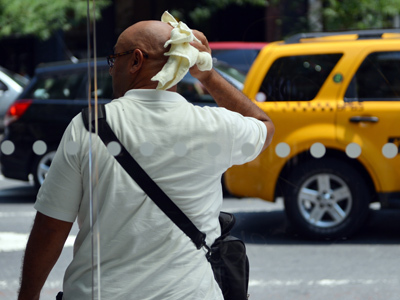 But record-breaking wildfires have now plagued Colorado for two summers in a row. 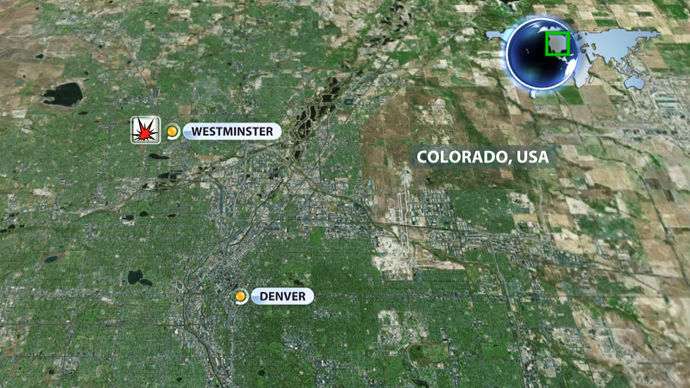 Last summer, the Waldo Canyon fire killed two residents and destroyed 347 homes near Colorado Springs. 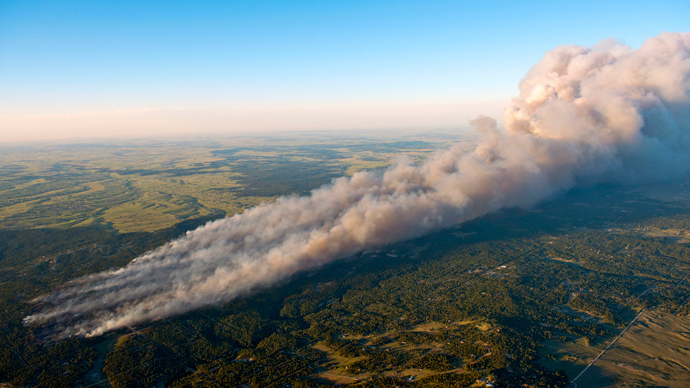 It quickly burned through more than 18,000 acres of land in less than a month. More than 32,000 residents were forced to evacuate their homes. The fire was considered the most destructive in state history until the Black Forest fire surpassed it last month. Although the hayfield fire in Weld County was small in comparison to some of the other fires the state has experienced this summer, it has gained significant attention due to the farmer’s courageous response. A video showing Howard’s tractor digging the fire lines has received thousands of upvotes and more than 1,800 comments on reddit, and the YouTube video has received around 130,000 views.